Manganese is an important chemical element used in manufacturing of alloys, batteries, glass and many other products. Manganese enhances the strength and reduces the brittleness of steel. Apart from manufacturing steel, manganese is also used as an alloy with aluminum and copper. Brazil, Ukraine, South Africa, Gabon, China and Australia contain more than 99% of total manganese ore reserves. Global manganese mining market is anticipated to grow at a CAGR of 3.6% over the forecast period. Rapid industrial development in the growing economies is expected to drive the growth of global manganese mining market during the forecast period. Manganese is used for the manufacturing of steels. Further, increasing consumption of steel is expected to spur the growth of global manganese mining market. Geographically, Asia-Pacific accounted for largest market in the terms of market size of overall manganese mining market. Further, it is estimated to continue its dominance over the forecast period due to the rising demand for steel from automotive. Growing infrastructure development activities is expected to supplement the growth of manganese market in Asia Pacific region. China and India are witnessing the augmented demand for steel which is further likely to impel the growth of Asia Pacific manganese mining market during the forecast period. On the basis of application, the segment is divided into alloys, electrolytic manganese dioxide and electrolytic manganese metals. Alloys segment captured the largest market share in overall manganese mining market due to massive utilization of steel across the globe. Manganese is the key ingredient to manufacture any type of steel. Global growth in the consumption of steel is expected to be the key factor behind the growth of global manganese mining market. Further, growth in infrastructure sector has been witnessed in recent years. Apart from this, automotive industries have been a major consumer for steel since decades. In recent years, automotive industries have expanded their presence in developing economies. These factors are expected to garner the growth of the global manganese mining market. Manganese is used to produce alkaline batteries. Surging use of batteries and increasing adoption of electric vehicles is likely to foster the growth of the manganese mining market during the forecast period. Further, growing use of batteries in consumer applications is expected to facilitate the expansion of global manganese mining market in the next few years. Moreover, availability of technically advanced equipment to extract the mines is likely to supplement the growth of the global manganese mining market. However, power and electricity issues in South Africa are expected to dampen the growth of global manganese mining market during the forecast period. 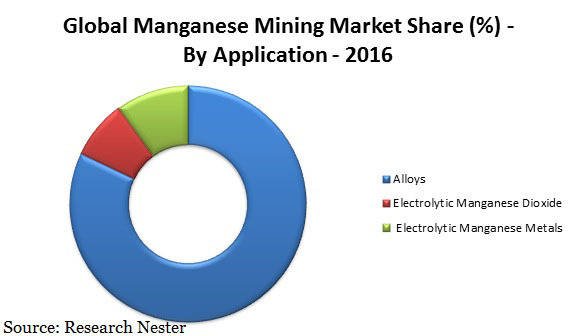 Additionally, lack of investment, inadequate skilled workforce and poor maintenance of the sector is anticipated to slow down the growth of global manganese market. S.K. Sarawangi & Co. Pvt. Ltd.